The Annenberg Foundation is a family foundation established in 1989. The Foundation supports the worldwide community through its grantmaking, technical assistance and direct charitable activities. Each year the Foundation gives grants and donations totaling more than $100 million both within Los Angeles and around the world. 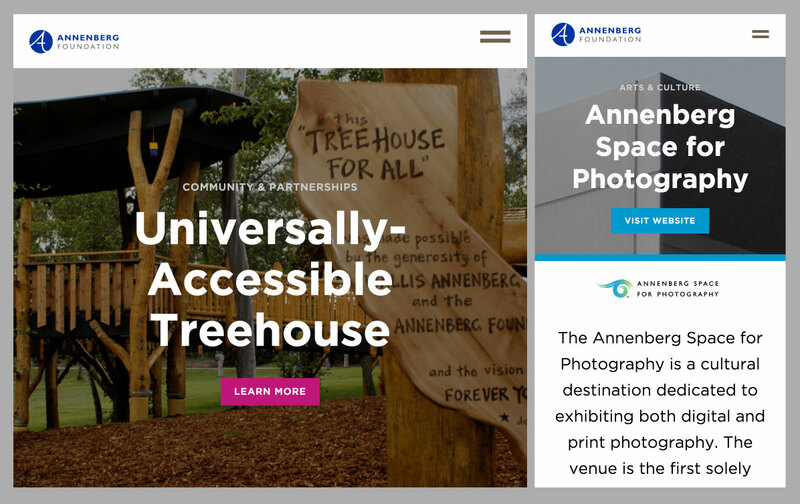 Historically, the Annenberg Foundation used a small team of contractors to build and maintain its web properties. However that model was showing its limitations. The Foundation came to Advomatic knowing our history of delivering ambitious web projects on time and on budget. We were also able to integrate their contractors into our team. This gave us direct access to the institutional knowledge of their past projects. 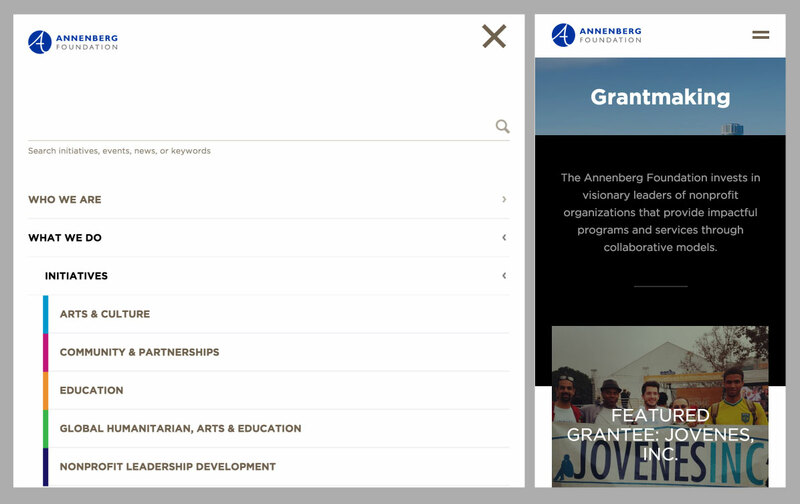 Annenberg.org is the primary face of the Foundation, so the presentation of the content needs to be of extremely high quality. This was an excellent fit for our team who aspire to bring the highest quality to all of our work. The Annenberg Foundation has a strong focus on photography. Annenberg.org is built of many media-rich pages that need to show many large, high resolution images, while not sacrificing performance. Our default starter kit has several security enhancements that puts us in an excellent place before we even start building the site. Our development runs in two week cycles. After every two weeks we have a formal testing process including both manual testing and automated tools. 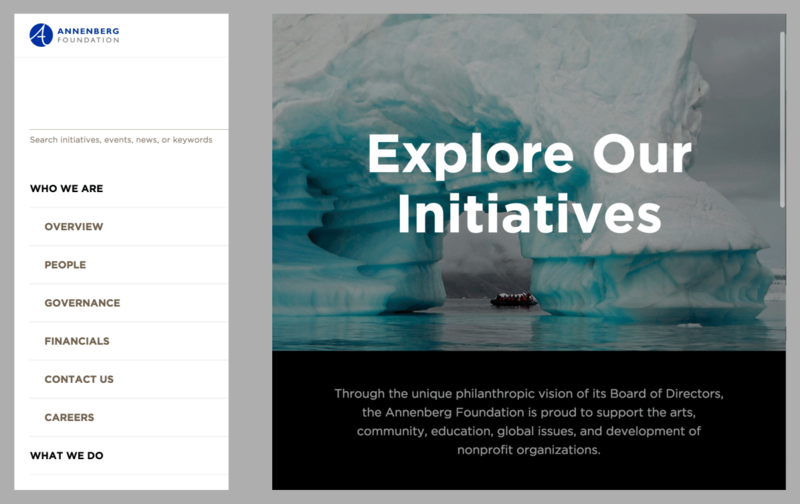 The back end of the site provides tools for administrators to improve accessibility, for instance, choosing the contrast of text on top of images. Some of the Foundation’s past web projects have had difficult-to-use administrative interfaces. This is something that many of our clients have struggled with from past vendors. It’s easy to build a site that matches design comps, but is impossible to make changes. In contrast we want the websites that we build to be loved by the people that manage the content. It’s built-in to our process. After every two weeks we have a formal testing process where we walk through the features that we just built from the perspective of an administrator, ensuring that everything just makes sense without the need for looking it up in a manual. Flexible layouts. Administrators can use a drag-n-drop interface to move components around the page. Media Library. Even for websites that don’t feature curated photography, having an easy to browse library of all the media used on the website makes it much easier to find that photo that you want to reuse. But for a site like this it’s a must-have. Content of every type starts with a default layout and default components. But every page on the site can be changed. If content creators want to remove components from the sidebars to focus attention on the main content, they can do that. If a particular piece of content becomes more complex than what’s typical, the content team can easily and completely change the layout of that single page in a way that works with the content. All without requiring a web developer to change the code or configuration of the site. Every organization changes. In five years the important issues that The Annenberg Foundation focuses on will be different than those of today. As new issues come into the spotlight, the Foundation can restructure the site to bring attention to those issues. Content administrators can create new landing pages made from a library of 37 editable components. Since the site’s launch we continue to work with the Foundation on additional projects, and are currently working on a project to rework the AnnenbergPhotospace.org to better support the unique needs of presenting curated photography on the web.